They are indeed all about proper soul food! Brothers of West African descent and the founders of WAKIKI, Fuad and Timi Animashaun are all about offering everyone the amazing experience of the infused flavours of African and Caribbean food. This motivated Timi to think, “there has to be a better way”. WAKIKI was born. His motivation for WAKIKI was to ensure efficient and quality delivery service, increased menu choices, flexible payment options and free supply of ergonomically designed, recyclable and easy to maintain temperature-controlled boxes for delivering customers’ food. Timi convinced his brother Fuad that if they focused on the points mentioned, they may be able to deliver a new approach to online deliveries of Afro Caribbean food – catered, prepped and groceries – to families and individuals who were keen to eat good, tasty, wholesome food in their homes which either reconnected them to their roots or took them on a new culinary adventure. Fuad and Timi created a philosophy and work ethos for WAKIKI called QTIP . . .
WAKIKI and all parties associated with WAKIKI sign up to fully adhere to the QTIP ethos. WAKIKI is all about ensuring the customer experience is stress free and memorable. 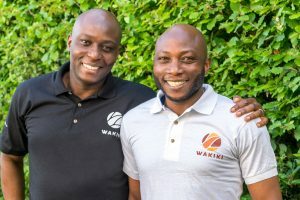 From exciting recipes, new serving suggestions to quality food, the founders Fuad and Timi are passionate about great food and quality service which is evident when ordering from WAKIKI.